TIRED of listening to FLUFF, and NOT getting results? -- In Just 21 DAYS or Less, GUARANTEED!" Discover EXACTLY how you can rid yourself of ANY bad habit - in just 21 DAYS or LESS! ... Using a proven SYSTEM that "real people" -- just like you -- have used to break the cycle of deeply entrenched, lifelong habits -- forever. What are your BAD HABITS costing you -- in MONEY, HEALTH, BUSINESS, RELATIONSHIPS? Of course not! Because your goals and dreams are priceless! Life is NOT a dress rehearsal -- it's a live show! You owe it to yourself to put in your best possible performance. And to do this, you need to lose the bad habits. Period. BOOT them... BUST them... BANISH them forever! Completely HOLDING you BACK from Success! Even though you recognize the stress they cause in your life... and even though you make promises to change your ways... again and again, you repeat the same tired patterns! That's because a habit, by definition, is an acquired pattern of behavior that has become almost involuntary as a result of frequent repetition. His teacher says, "Now you see the power of repeated actions...habits. It takes more than mere willpower and personal strength to break them. It takes a change in the way you think about the problem." BAD habits prevent you from reaching your potential. They're self-inflicted punishments that drain you of motivation, time, and money. And they hold you back from living the great life you know you can achieve. You get so stressed out when denied the habit that has given you comfort in the past, you cannot help but cling to it and repeat it in the present. Losing bad habits requires you to change the way you think before you can change the way you act. The list goes on and on! - Using This PROVEN System from Lee Milteer! Lee is one of THE most highly esteemed and sought after human potential speakers and productivity coaches around. And on this page, I'll take you through her step-by-step "Habit Busting Secrets" SYSTEM to help you RELEASE bad habits once and for all! Xerox, IBM, the US Navy -- And Many Others! Lee Milteer is one of America's most highly-esteemed and sought after human potential speakers and productivity coaches. In addition, Lee has been featured as a regular guest on National TV and Radio shows, including "The Sally Jesse Raphael Show", CNN's "Sonya Live", and "The Montel Williams Show", "The Dini Petty Show", and more! She has also written many books, including "Feel & Grow Rich," "Success Is An Inside Job: The Secrets of Getting Anything You Want," and "Spiritual Power Tools for Successful Selling." Lee Reserves for Her Most Influential Clients! I used to have a bad habit (it's too embarrassing to tell you WHAT it is here)... But let's just say I searched high and low for a solution... I was desperate to break it! ">Habit Busting Secrets: How to Break Any Habit in 21 Days." And WOW. I couldn't BELIEVE what I'd been missing all along! Here was all of the information I needed to get rid of my bad habits permanently in one easy-to-follow system. What makes this find even more amazing is that it's a system that was previously only available to members of Lee's Millionaire Mindset program, and it contains information that major corporations like Walt Disney... AT&T... XEROX... IBM... and others pay thousands of dollars to pass on to their employees and make their businesses stronger! Why visualization isn't just FRU-FRU HULLABALOO! Her work is amazing. So amazing, in fact, that I ended up working with Lee in business -- to help get her message out to the world. It's really SO powerful that I've dedicated my entire life to promoting it. Recommendations don't get much better than that. Imagine Friends Being AMAZED at the Change! Heck, you may even surprise yourself! All of these people were able to transform the lives they had settled for into the lives they lived for. Just take a look at some of their stories! Of Individuals Using Lee's Habit Busting System! "Lee, you received the highest evaluations of anyone's programs we have ever used in our office. One of the programs that really hit home was your Habit Busting: How to Break Any Habit in 21 Days. At first people laughed and said no one could change bad habits in 21 days. Yet, people in our office who took your program home and used it proved them wrong. Paul S. Gorkin, Gorkin Reality, GA.
My office, house and car were beyond out of control to the point I did not want anyone to see them. This Habit Busting system assisted me in finding out why I could not get the energy to be an organized person. I was a perfectionist! As Lee says, give up that label and change your life forever. This came true for me. Now before we go any further, I MUST give you fair warning. If that's the case, please be honest with yourself and exit this site right now. If you are not open to real breakthroughs in your life, this is not the program for you. And Giving Yourself a New Lease of Life REVEALED! You've heard how others have changed their lives through this program. With "Habit Busting Secrets", you can STOP the past from becoming the FUTURE! But I've kept the best news until last! 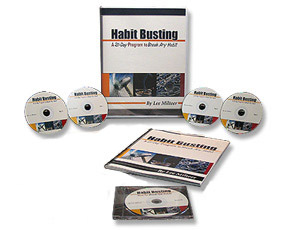 Even though Lee Milteer travels the world giving seminars and speaking at huge corporations who pay thousands of dollars for her expertise..
... All of Lee Milteer's habit busting secrets are available to you through the complete "Habit Busting: How to Break Any Habit in 21 Days" program (on 4 audio CDs with an accompanying 52-page guidebook) -- for the discount price of $97! You can download all of the CD directly from this site. Burn them to audio CD, play them on your iPod, listen while you work -- but whatever you do, TAKE ACTION NOW. Within minutes of saying YES, you'll be busting your deepest habits - FOR GOOD! From REAL PEOPLE, Using Lee's System! Try Out the ENTIRE COURSE for 90 DAYS! Give You a 100% REFUND - No Questions Asked! You can keep doing what you have been doing, which guarantees you will get what you have always gotten. Or you can do it differently and get all the things you've ever wanted. I'm so confident of this that, when you purchase this program -- at the discounted price of $97 -- you also receive my 100% 90-day money-back guarantee! Yep, you read it right... If you try this program and it doesn't work for you within 90 days, we'll give you a FULL REFUND of your investment! No hassles. No questions asked. You get to use this program for a full 90 days (minimum 21 days) -- and remember, it's PROVEN to produce powerful results in 21 DAYS -- or less! Now that is a sweet deal! And, if you order now, I'll also give you the link to a special bonus audio CD of Lee's Motivational "Habit Busting Coaching" -- valued at $97 -- yours absolutely FREE! You'll learn how YOU can teach others to release THEIR addictions and habits - and you'll be able to say you were personally taught by Lee Milteer! This is YOUR TIME. Change Bad Habits for GOOD. Let Lee Be YOUR COACH Over the NEXT 21 DAYS! And it's not too late to learn the secrets of how your mind works, and to change your desires, behaviors, and goals. I don't care who you are or what you do for a living. Whether you're slogging your way through a mountain of debt, or raking in a whopping six-figure income, this program can help you. .... You are JUST 21 DAYS away from that goal. Don't delay as the discounted price of $97 is only available for a short period of time... And then I will be raising the price back up to the regular $149.95! ENTIRE COURSE for Just $47!! You've arrived at this page just in time to take advantage of my special "Explode your habits today for only $47 offer!" You are one of the lucky people to have arrived on April, 21st -- which means I'm going to give you the ENTIRE $244.00 worth of Lee's Habit Busting materials for just $47! That's a MASSIVE SAVING. You won't find Lee's course sold ANYWHERE ELSE -- and certainly not for as little as $47! Tell your friends and family about this offer, because it will only be around until the next ( 100 ) 68 trial copies are gone! I *do* expect to remove this offer and raise the price once again when they have all been claimed! How to Break Any Habit in 21 Days", NOW! CLICK ABOVE to order online using our secure server. All major cards accepted, plus checks and telephone orders. including the $97 FREE bonus CD... All for JUST $47! FULL REFUND, with no questions asked! You know why you're here. This is YOUR time to change. Get ready to enjoy your new life. Click HERE to order the course! Wishing you massive success, forever and always. Author: "Cheats Guide to Instant Genius"; "The Speed Reading Secret"
PS. Remember, you MUST order quickly to take advantage of this special offer price! When our ( 100 ) 68 trial copies are gone, we'll be boosting the price, and you will NO LONGER be able to claim the special BONUS CD (worth $97!!). There's never been a better time to change with Lee Milteer. Click HERE to take action! PPS. If you try this program and it doesn't work for you, just let us know and we'll give you a FULL REFUND! No questions asked. Click HERE to get started!